Before the major bridge construction and new interchange configuration at the Interstate 94 (I-94) and Sheyenne Street 2018 project work winds down, the work zone will have one last traffic shift. 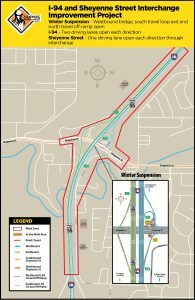 This evening, Friday, November 9, contractors will open the new northbound only off-ramp for travel to Sheyenne Street. This ramp will route traffic further north and out of the current intersection area to enter Sheyenne Street traffic. North on Sheyenne Street (346-B): use the westbound off-ramp to only travel north. No left-turns allowed. 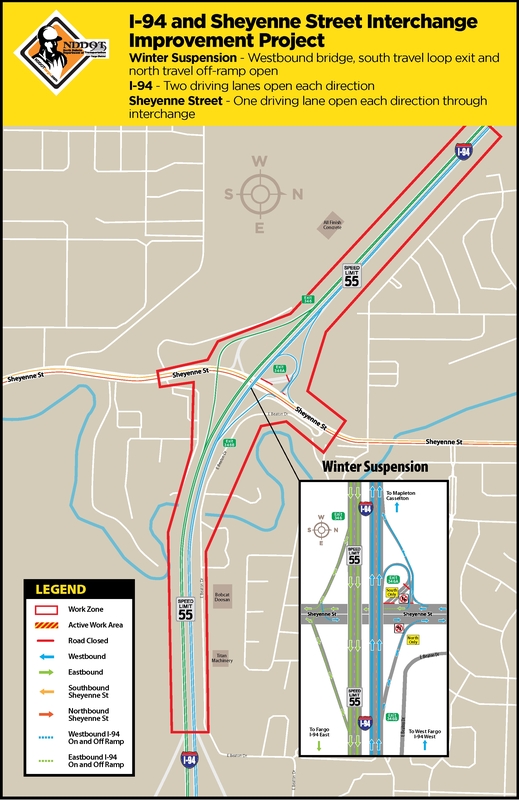 Early this morning, crews started working on a few changes to traffic control to help reduce confusion, starting with adjusting the signal heads and signal light phasing for the off-ramp to support drivers and ease confusion on use of the interchange. A message board has been placed between Veteran’s Blvd and Sheyenne Street to give drivers notice which exit to take just prior to the interchange ramps. Eastbound and westbound I-94 are open with two driving lanes in each direction through the Sheyenne Street interchange. Speeds have increased to 55 mph for motorists. Motorists should obey posted speeds and minimize distractions while driving through the remaining work zone.